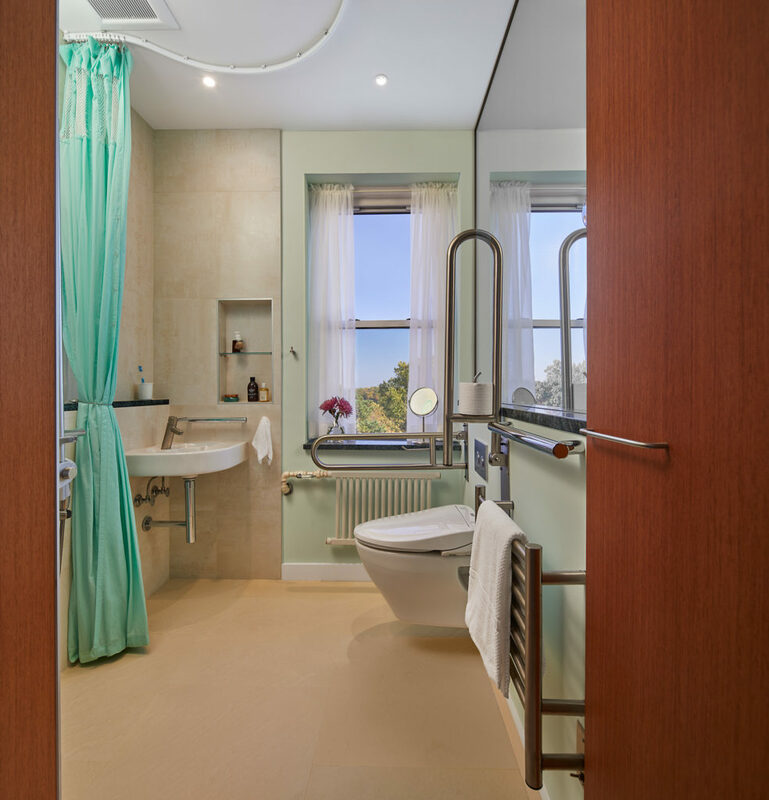 With an eye toward the future, a retired orthopedic surgeon set his sights on an accessible remodel in a historic high-rise in Northwest DC. 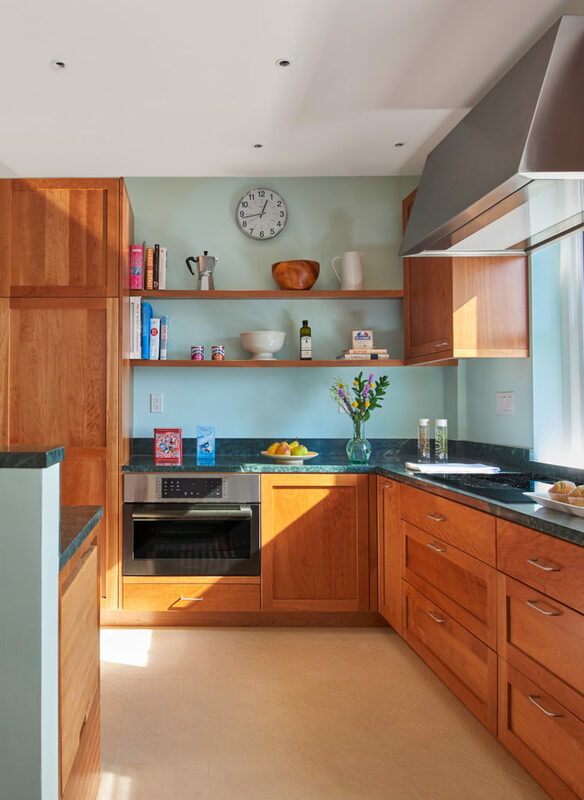 The kitchen’s cherry mass wall includes a narrow pullout pantry, 24-inch refrigerator column, two freezer drawers, and microwave with pullout shelf below. Rollout shelves keep everyday items within reach, while higher cabinets provide essential storage for seasonal supplies. Perimeter cabinetry houses an under-counter speed oven, induction cooktop, and drawer bases for convenient access. Counters measure 32.5 inches in height—lower than the usual 36 inches—to increase usability. The matching island has two levels: standard-height to accommodate the dishwasher and wine fridge and a lowered prep sink and work area. 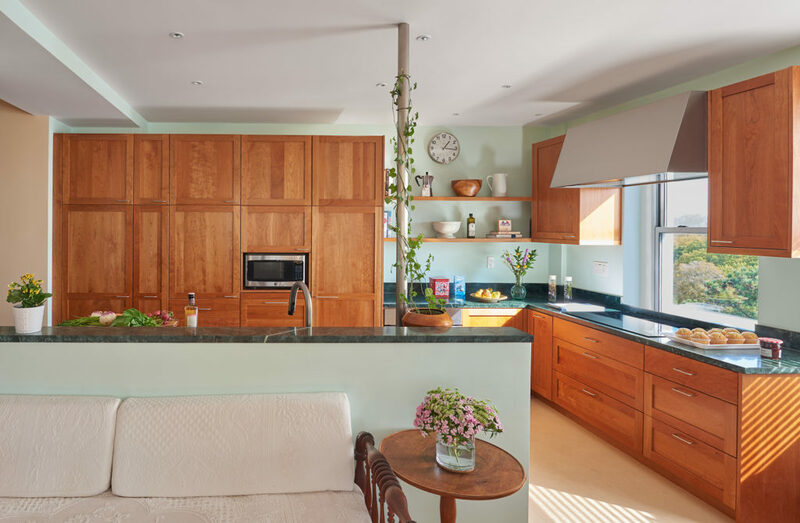 The kitchen’s open design plan and wide aisles allow for easy movement between workstations and into the adjoining living area—even with a walker or wheelchair. Underfoot, foam rubber tiles provide extra traction and comfort. Designed for aquatic environments like pool decks, the slip-resistant tiles are waterproof, low-maintenance, and resistant to stains, mold, and bacteria. Even better, should a fall happen, the cushioned surface softens the landing. 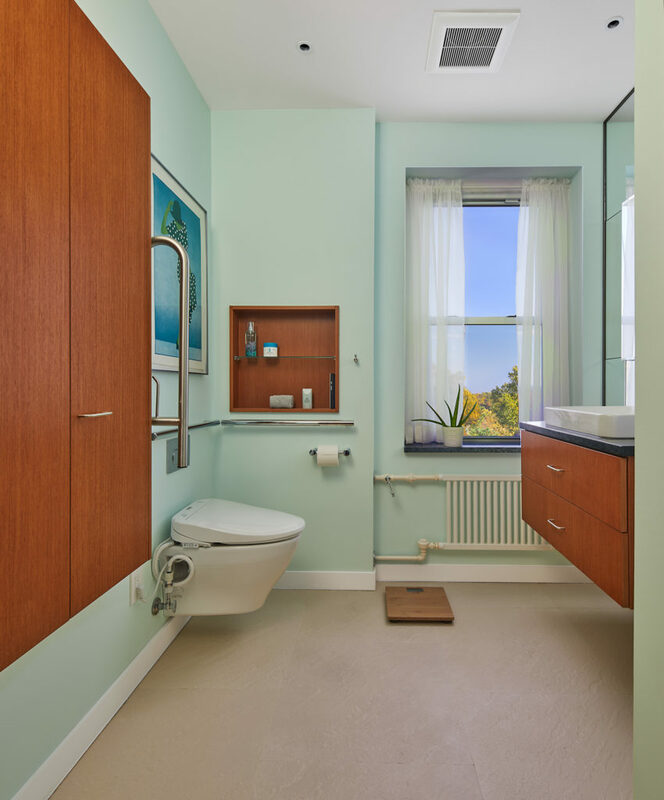 Designed with accessibility top of mind, this master bathroom includes an open shower with floor-to-ceiling curtain, small corner sink, and multi-function bidet with grab bar for standing and sitting (and an integrated toilet paper holder). Underfoot, foam rubber tiles provide extra traction and comfort. Made for aquatic environments like pool decks, the slip-resistant tiles are waterproof, low-maintenance, and resistant to stains, mold, and bacteria. Even better, should a fall happen, the cushioned surface softens the landing. 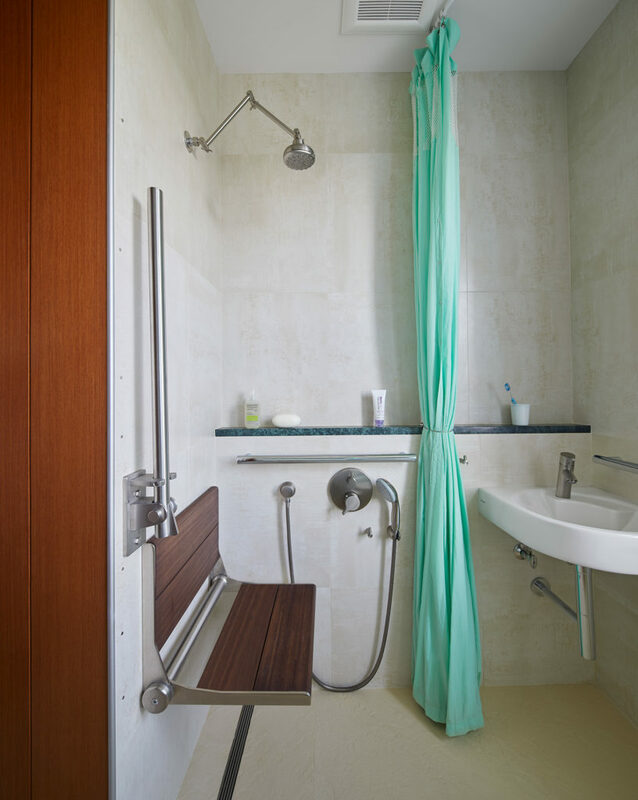 The barrier-free shower features a fold-up bench and fold-down grab bar for flexible use. An articulated showerhead and hand shower—with waist-high thermostatic controls—also cater to user preferences and abilities. The floor slopes slightly toward a linear wall drain to keep water at bay. 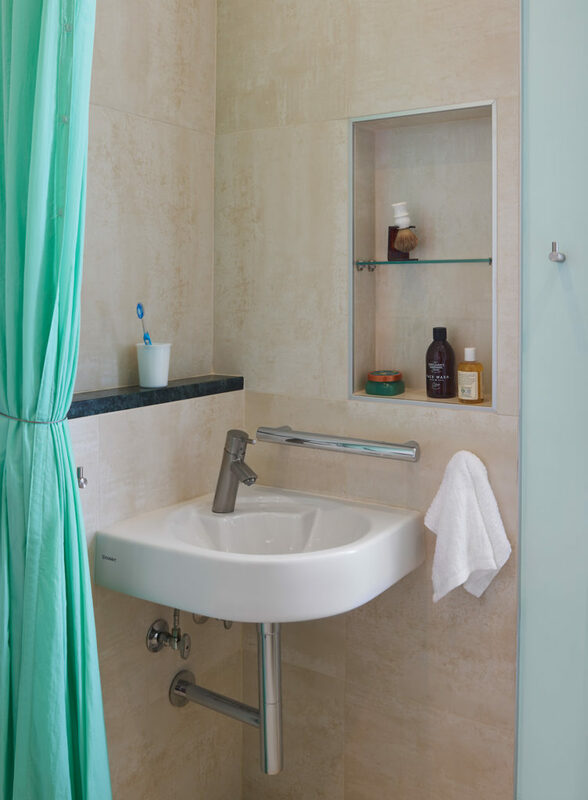 A nearby corner sink adjacent to the open shower offers even more cleansing options. A convenient shower shelf extends behind the sink, while niche storage keeps essentials within reach. The powder room also has a bidet, along with a more generous sink and vanity and recessed tall cabinetry for extra storage. Other shared features include convenient shelf and niche storage, bright LED lighting, and expansive mirrors.